SPCA Serving Erie County, the 2nd oldest humane society in the US, provides essential adoption, rescue, and other animal-related services to the residents of Erie County, NY. 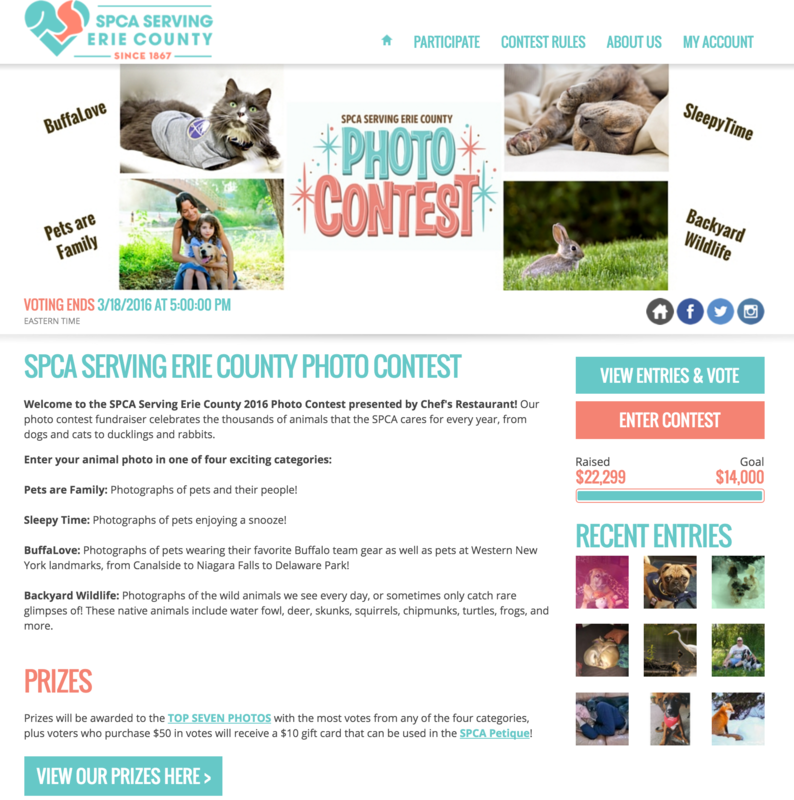 Their SPCA Serving Erie County 2016 Photo Contest launched on 2/22/2016 and ran for three and a half weeks, closing on 3/18/2016. Prizes were awarded to the top seven photos receiving the most votes. These prizes included cash prizes, photo sessions, and tickets to premiere events. Their contest did not include a calendar as a prize. They also awarded a $10 gift card to their SPCA Petique to those who donated $50 in votes. Leap Day Promotion: Anyone donating $20 in votes on 2/29 received a 9 bonus votes. Flash Sale: On 3/8, anyone who donated $25 in votes received an additional 25 votes in their vote bank. The "sale" ran from 9 AM to 2 PM EST. Flash Sale: On 3/13, anyone who donated $20 in votes received 10 votes free. St. Patrick's Day Promotion: Anyone who donated votes before 2:00 PM EST received double votes. The vote promotional periods were advertised by SPCA Serving Erie County through email blasts, Facebook posts, and Twitter posts. Interested in running a vote promotional period during your contest? Let us know and we'll help you out!